I would like to bring to attention of users the Android-manager for Secu-3. Its development has been being carried out since end of February – beginning of March 2013, but due to some reasons the project hasn’t been represented to community before. Currently, due to appearance of official manager, I’ve decided to publish my project. - presence indication of CE-errors, viewing of errors in real time, viewing, changing and recording of saved errors. Errors indication with inertness. 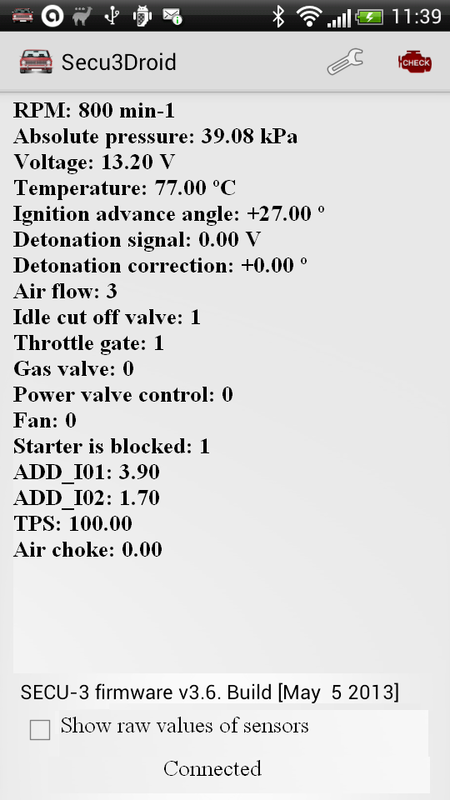 - inputs and outputs diagnostics. Operation with device is carried out as follows. To have the possibility to choose the double device for connection, Bluetooth in smartphone should be off before the first manager run. Switch on Bluetooth, run the program, enter the menu "Settings", press "Choose Bluetooth Device" and choose Secu-3 device in this list. Before then the device should be doubled by means of smartphone, manager doesn’t support the devices search and doubling. It would seem, the Bluetooth module in majority of Secu-3 devices has name "linvor". I have another module that is why the name doesn’t coincide. Also it is necessary to choose the version of your Secu-3 firmware and, if it is needed, binary mode protocol. After this you need to restart manager or call it up over again by means of shortcut in status bar of smartphone. 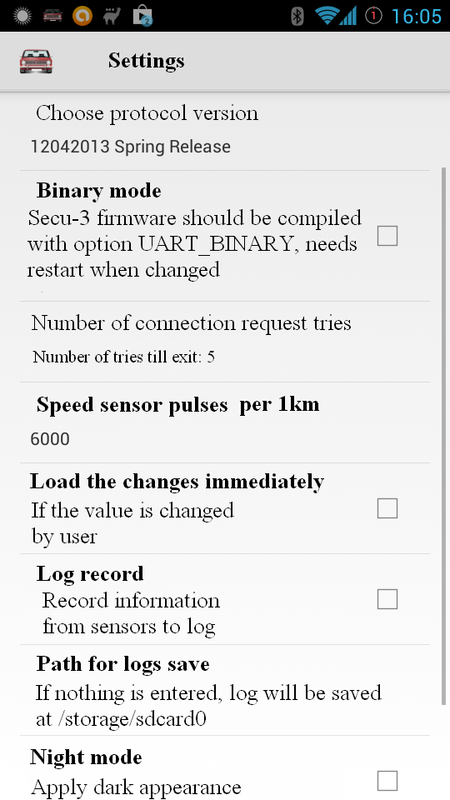 If Secu-3 connected successfully the data from sensors, firmware information and status “Connected” will appear on the screen. If the status is “Disconnected” this means the connection with device failed or ignition was off during the operation. There were cases, when I solved the problem by restarting of manager or turning off/on the Bluetooth in smartphone. To quit the manager you should choose the point “Exit” in menu. 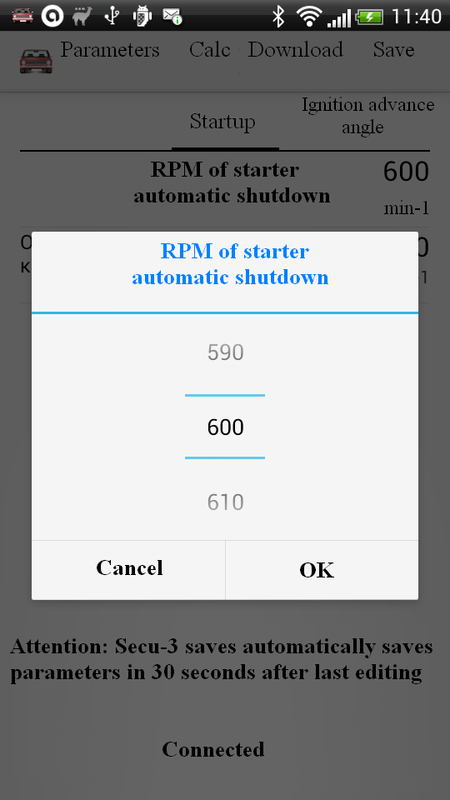 To view the CE errors press the sign of engine, to view and edit the settings press the sign, which corresponds to settings sign in your phone. In my case this is wrench sign. I wrote manager during my leisure time, when I was not very busy at work. Currently some changes in development speed may occur. That is why I appeal to developers and users to join the development of this manager, because I see several advantages in projects with open source code. The project is available in git-repository at address https://github.com/mmlevin/secu3droid. The project is released under the GNU GPL license, that is why if the source code is used somewhere else, the source code should be released. Additionally I would like to admit that I don’t have the real device that is why all operations were checked by means of device emulator on PC, to which the adaptor Com-To-Bluetooth was connected. 17.05.2013: was fixed analogous error in window of errors indication, basic diagnostic functions of device input and output were added. 19.06.2013: were added the possibility to record logs. For this aim it is needed to put the corresponding tick in settings. In this case the log record will start automatically when data from Secu-3 is received. 25.06.2013: were added the possibility to choose the path for logs saving in settings window. 26.06.2013: was fixed the compatibility error. 01.07.2013: was added the permission BLUETOOTH_ADMIN. 02.07.2013: was rebuild the application for troubleshooting at startup, for information of developers: you should obligatory carry out Project Clean before export to *apk. 22.07.2013: much-heralded great update. Russian localization was added. New interface, which is more finger-oriented in the modes of parameters editing, errors viewing, diagnostics. Several errors were fixed, particularly processing of screen orientation change. Also was added the possibility to choose color scheme - day and night mode (to apply you need to restart the program). Useful hint: in parameter editing mode (where the values are scrolled with finger) it is possible to enter the value manually by pressing the number in the middle. 13.09.2013: new protocol implementation. Now not only the latest version is supported, but also previous version (that is spring and summer firmware releases), hereafter as new releases will come, they will be added to the supported. The binary mode, which appeared in summer release, is also supported. Another new perks of summer release are supported – speed sensor, immobilizer, Bluetooth password change. Corresponding adjustments should be done in menu. I cannot check the Bluetooth password change, because I don’t have real Secu-3, all operations are carried out on simulator. 04.10.2013: for some reason 13 is considered to be an unhappy number! The previous version had several mistakes, which made its use impossible. Found errors are fixed, the dialog of numbers entering with floating point was slightly changed. 11.11.2013: was fixed the error with indication of raw sensors values. I also fixed the value record of Hall sensor output in pulley teeth. Also I fixed the sensors indication by returning from other windows. Some improvements in protocol implementation were done. Comment regarding error with errors reading in real time: I analyzed the situation and noticed that after returning from parameters reading mode at entering to indication mode of real time errors sometimes because of some reason the parameters are read anew and pause occurs in delays indication. Nevertheless after some time (up to 15 sec) the errors are still displayed on screen. The reason of such behavior should be found. As well as starvations in exchange, which appear sometimes. 13.11.2013: was added Ukrainian localization, translation author - Forumets V.
14.11.2013: was added a record option of data exchange protocol between manager and device. Most users don’t need it, that’s why there’s no need to update for them. 28.11.2013: hi, winter! The indication of negative temperature is fixed. 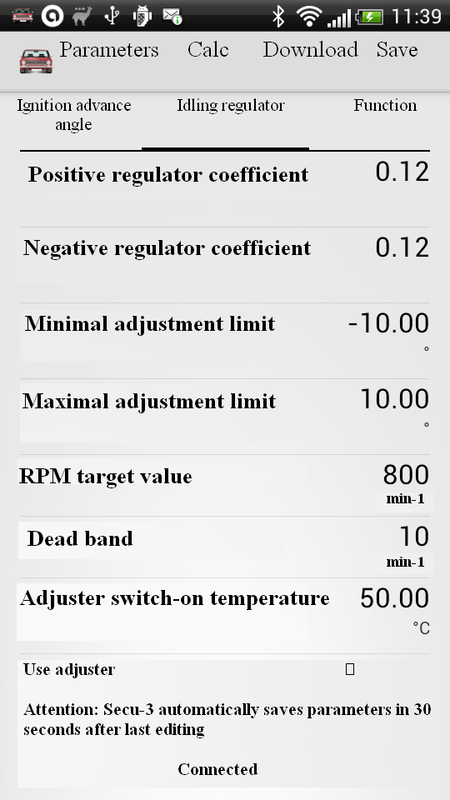 22.01.2014: support of winter firmware release: diagnostic of BL and DE outputs, addition of markers to log-file (via the menu of main window), maximal value of suction engine steps. 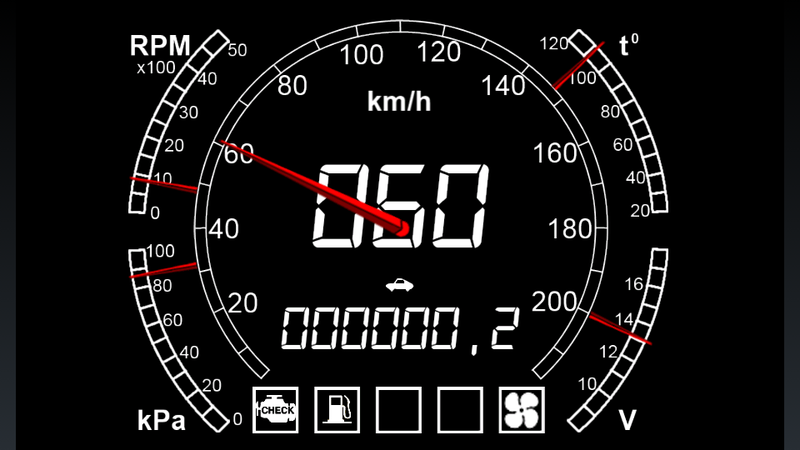 The indication of driving speed was also fixed (correspondingly it is also recorded to log now). The choice of delimiter character for log was added. Processing of entry and exit into outputs diagnostic mode was improved. Small corrections and improvements. 28.01.2014: markers insertion buttons are on the main screen (could be seen only if the log record is enabled in settings). Switching of raw data is removed to menu. Were added settings for screen shutdown prohibition (only for window with sensors data) and sleep mode prohibition of Android device (all the time as long as Secu3Droid is active). I don’t have a possibility to test it, because my cell phone is being dried on radiator. 16.05.2014: control panel mode is added. To activate it from main window you need to choose menu item “Control Panel”, to return - press device button “Back”. Sign “Car” in the middle signals about connectivity with Secu. This is my first shot in this field of work. Form designed I haven’t done yet – shift-lamp, indication of choke opening percent, adjustment and indication of ignition advance angle. But the possibility is built to have changeable control panels in program and it is comparatively easy to create them. For current version of control panel, which is made in the style of NFS, we would like to thank all at once the forum member - alvikagal. P.S. it is a nicely convenient, that today new firmware and Secu-3 manager version have come. Currently I can’t say anything in this regard – I didn’t manage to run this version in simulator and to connect it with own manager, I’ll try to find out the reasons of it. That’s why I can’t say, if this Secu3Droid version will be able to operate with the last release. Most likely that it won’t, as new fields were added to the Secu3Dat pack. I’ll try to sort the things out.